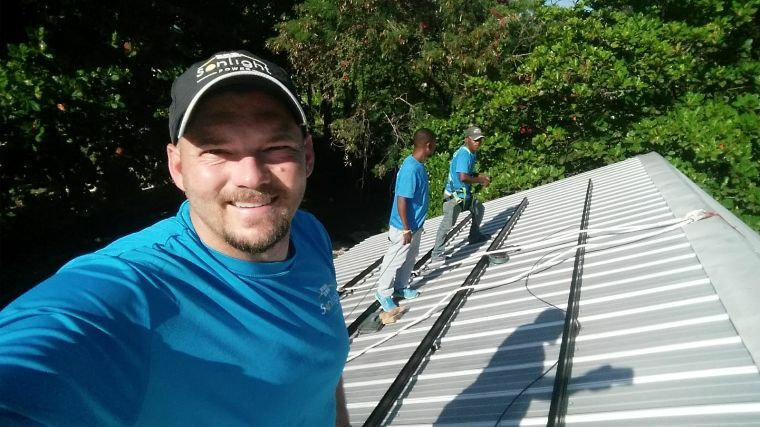 Solar energy has come to one of the largest Christian mission campuses in Haiti thanks to you and a team from SonLight Power. In November, the six-person team installed solar panels on the rooftop at the Christian Vision Eye Services to Haiti (CVESH) clinic. Led by Clay Luna, SonLight Power Director of Programs, the team installed 12 panels, eight solar batteries and re-engineered the eye clinic’s electrical work. 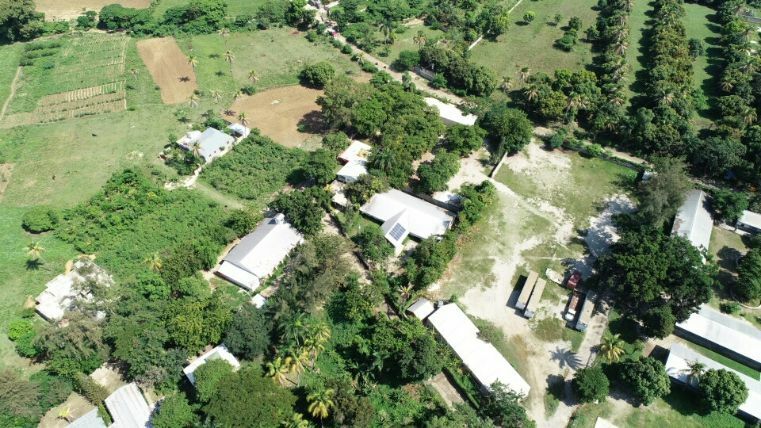 The Christianville mission in Haiti was established in the late 1980s and covers nearly 50 acres of land along the southern peninsula of the country. Although damaged by the earthquake in 2010, the campus has continued to grow, expanding to provide much needed vision and dental care. There are nearly 30 buildings on the Christianville campus – one of which is the CVESH eye clinic that burgeons with activity. Glaucoma is a major eye disease in Haiti that can ultimately lead to blindness. Traci noted that the disease involves pressure on the optic nerve and can affect patients of all ages. Doctors at CVESH have treated glaucoma patients as young as age 10. The entire Christianville campus was wired years ago to become an interconnected micro-grid, but the power is provided by diesel generators that are expensive to operate and frequently break down. As the campus has grown, Traci said, the generators were struggling to provide enough power. Fuel costs alone exceeded $300 a day, or about $110,000 annually. Thanks to you, the solar power installed by SonLight Power now makes the eye clinic energy independent, removing it from the Christianville grid. CVESH’s self-sufficiency has relieved the strain on the generators and drastically lowered the mission’s fuel expenses. Importantly, Traci continued, it means the doctors can focus on their patients without worrying about power. The SonLight Power team added new solar infrastructure and improved existing electrical work. Robert, who is from Groton, Connecticut, has been interested in solar power for years. While looking for an opportunity to make a lasting difference, he found SonLight Power online. 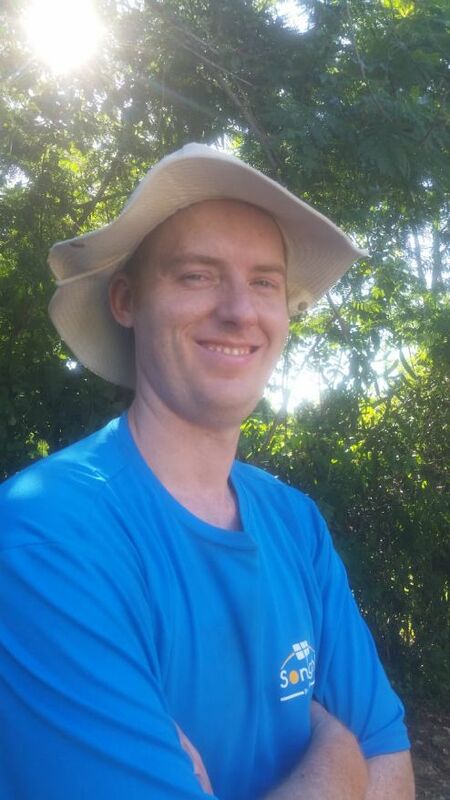 Robert attended SonLight Power Solar School in June 2018, which helped equip him for the trip. “I’ve been wanting some hands-on experience looking for opportunities with solar ovens and solar lamps, so this was interesting to me,” he said. Robert had been on mission trips before, but mostly teaching English or leading vacation bible school activities. “This was the first trip that required some manual labor,” he laughed. Robert is excited about the difference the new solar power system is making for the eye clinic and the Christianville campus. Traci and her team are looking forward to SonLight Power returning to the campus soon to install solar panels on some of the other buildings. Wondering how you can get involved with SonLight Power? Consider registering for an upcoming Solar School workshop, helping sponsor a project , or joining a SonLight Power trip.